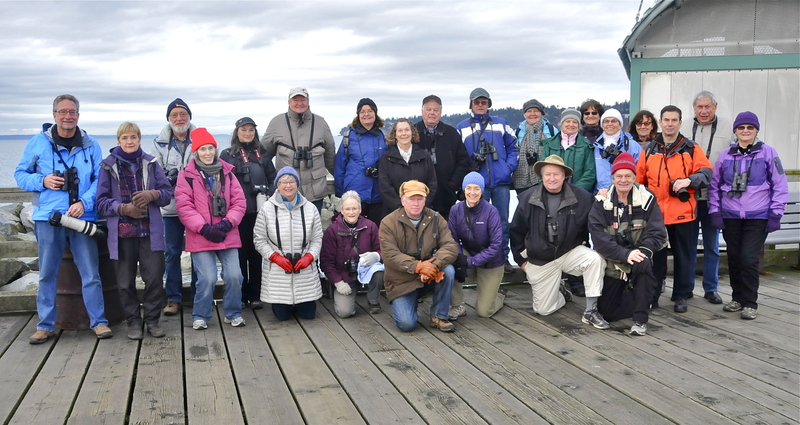 A decent weather forecast brought DNCBers out en masse and we had 27 participants (see List at end, and Ken’s photo on our DNCB website) Tuesday on our White Rock Pier and Blackie Spit outing. It was a beaut day with lots of neat sightings; check out the brilliant photo evidence by Jim K (JK), Brian (BA), Liz (LS), Pascale & Alberto (P&A), Marion (MS), Terry (TC), Pat (PS) and Ken (KB) on our DNCB Picasa site (just click here). Ten of us left Petra’s in umpteen vehicles (poor car-pooling) at 8:00 a.m. and we met at 8:45 a.m. (right on time) at the start of the White Rock Pier. We decided to make the Pier our first stop because parking is free there until 10:00 a.m. (DNCBers are a frugal lot). The first thing we noticed was that the trees and bushes along the shore above the “White Rock” were all removed; don’t know why (blocking sight line of residents?). The tide was very high with no beach showing, so there were lots of species close to shore and the pier; namely, Surf and White-winged Scoters, Bufflehead, Common Goldeneye (some saw a Barrow’s), Common Loons, Horned Grebes, Northern Pintail and Mallards. Photogs were ecstatic getting up-close-and-personal shots. We meandered to the end of the pier, basically in small Chat Groups. The pier got crowded, but there was no place to go, so assembling for the Group Photo was not as arduous as on most outings. It was neat to see Greater Scaup swimming beneath us; we normally see Lesser Scaup in the fresh water lakes and ponds. And a flock of Black Turnstones was flitting very close to us among the pier boulders. We had a couple of good Scopes (thanks Jean, Brian, Ken & Roger) with us and were able to see Pacific and Red-throated Loons in the distance. We couldn’t find our target bird, an Eared Grebe, among the many Horned. The always-attractive Long-tailed Ducks, and Red-breasted Mergansers came close enough for good views and shots (photography not gun). Both Pelagic and Double-crested Cormorants were diving there too and, of course, a Bald Eagle was posted on a pylon. Approaching our 10:00 a.m. parking curfew, we decided to leave the pier for Blackie Spit. However, Lidia advised that Black Scoters were seen at the end of the boardwalk parking lot, so we stopped there for a squint. A very fortuitous stop, we got the Trifecta of Scoters (Liz’s terminology) and some photogs even got all three species in one frame. Blackie Spit was productive too. Among the large numbers of Northern Pintail, American Wigeon and Green-winged Teal we found one Marbled Godwit. There have been four (?) Marbled Godwits and a Long-billed Curlew resident there the past few Winters. Ken and Anne saw two Godwits at the Pump House near the Gardens, and Marion saw the Curlew with three Godwits. Interestingly, among the Wigeon in this park, we saw at least 25 male Eurasian Wigeon (which means there were probably 25 females there too). That’s a higher number than we normally see. We wandered out to the spit; saw a small flock of Sanderling (~dozen birds) and a larger swarm of Dunlin fly by. Two Dunlin landed at the spit for their photo shoot. Lots of Ring-billed Gulls among the Glaucous-winged. We left the Spit and walked to the Rene Savenye area of the Park. Roger and Marion saw Greater Yellowlegs; we saw House Finches, Northern Flickers, Song and Golden-crowned Sparrows, an Anna’s Hummingbird, and a fly-by flock of Snow Geese. Perhaps we didn’t see much during the last half hour of our outing because the group was apparently starving and the focus was on a Lunch venue rather than Birds. Approaching Noon, we decided to abort the outing and ten of us went for lunch at the Ocean Park Village Pub. Another good decision, two pints of Okanagan Springs 1516 Lager and a delicious Seafood Pasta Pie with garlic bread hit the spot. Another awesome DNCB outing. We 27 were: Roger M. Mike B, Anne M, newbie Margaretha & David M, Terry, Rob & Marylile, Jim K, Ken B & Anne A, Mary T, White Rock Al, Jean G & Pauline O, Marion S & Marti W, Lidia, Brian A, Liz S, Pat S, Fern F and Aussie Nance, and time-challenged Kirsten W and Pascale & Alberto, and me. Next Tuesday, January 26, we will be going to Stanley Park and Beaver Lake, leaving Petra’s at 8:00 a.m.; meeting at Second Beach parking lot (near Swimming Pool) around 8:45 -9:00 a.m. Note this CHANGE from scheduled outing to Whytecliff/Lighthouse Parks in West Vancouver. This entry was posted in *DNCB, Bald Eagle, Barrow's Goldeneye, Black Scoter, Black Turnstone, Dunlin, Eurasian Wigeon, Long-billed Curlew, Long-tailed Duck, Marbled Godwit, Pelagic Cormorant, Red-breasted Merganser. Bookmark the permalink. Hello, I just wanted to let you know that I find your posts very helpful when it comes to finding where all the birds are. Hope you don’t mind that I linked to this post in my latest blog entry. Have a great day! Not a problem! If you look at the right column, you may find other useful links under titles “Birding Links” and “Blogs”.